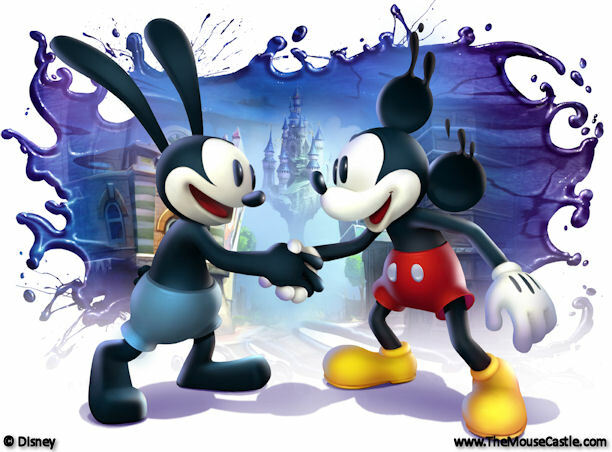 Mickey Mouse and Oswald, together again. 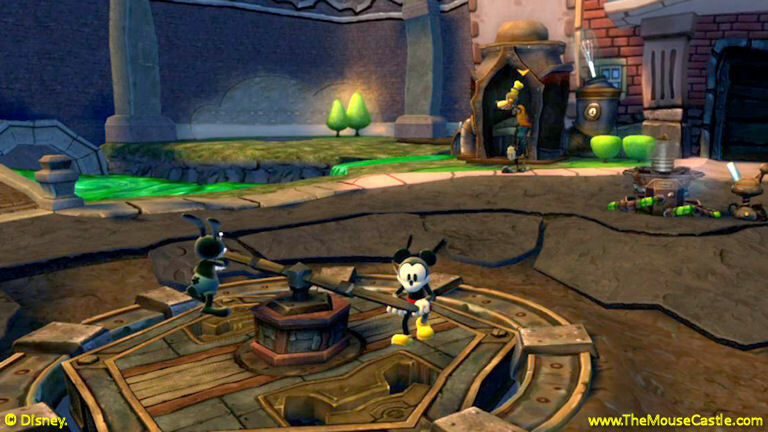 This fall, Mickey Mouse returns to Wasteland and makes nice with his cartoon rival Oswald when the video game adventure Epic Mickey 2: The Power of Two makes its debut. It promises to be an improvement on its predecessor. Epic Mickey was a popular title for Disney Interactive Studios and game developer Junction Point when it was released in 2010, but it was criticized for issues with its POV camera that made it difficult to navigate Mickey through the twisted alternate reality of forgotten Disney characters and theme park attractions. 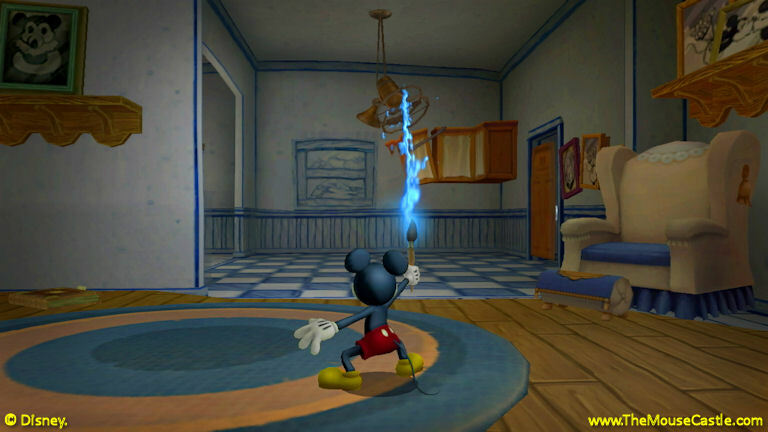 Gamers were also disappointed that Mickey (along with all the other characters) didn't speak except for uttering squeaky gibberish. 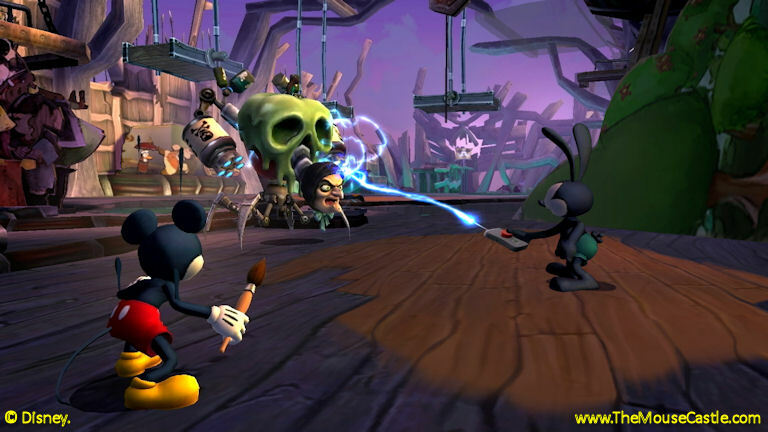 Both these issues are expected to be remedied in Epic Mickey 2. Game play will be more fluid and not only will the characters talk, they'll also break into song. 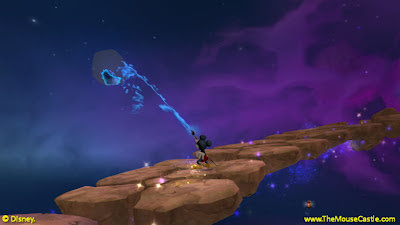 The Power of Two isn't just going to be an epic adventure. It's going to be a musical. 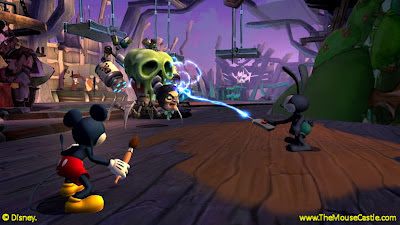 I'm a fan of the original Epic Mickey and found the criticisms leveled at it to be mostly nitpicking. 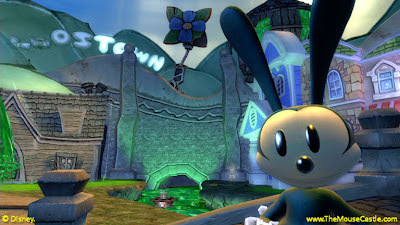 The game play to me was almost secondary to the detailed Disney-on-crack levels that designer Warren Spector and his team put together: a forbidding "Mean Street" in place of Main Street, U.S.A., a violent and psychotic "It's a Small World" clock, a jealous and vindictive Oswald the Lucky Rabbit. 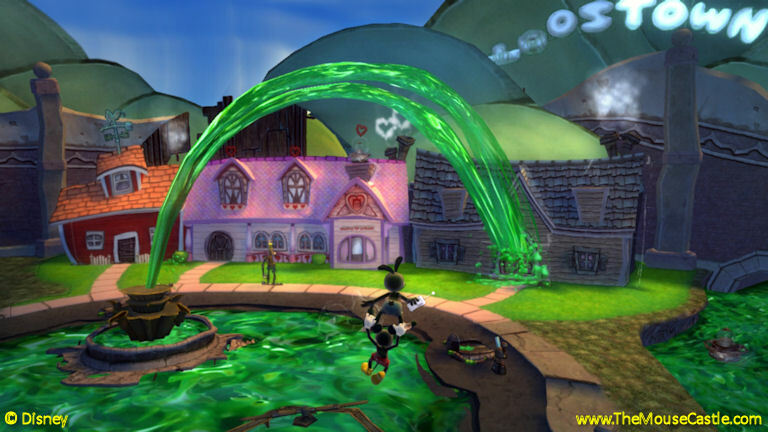 And, despite the perverse look the game took at its subject matter, it still managed to pay loving homage to over 80 years of Disney movie and theme park magic. In Epic Mickey 2, Wasteland will once again be fraught with troubles that the intrepid mouse will have to resolve with the use of paint to repair and thinner to dissolve. There will be tandem play that will bring Oswald to Mickey's side with a handy remote control that channels electricity. 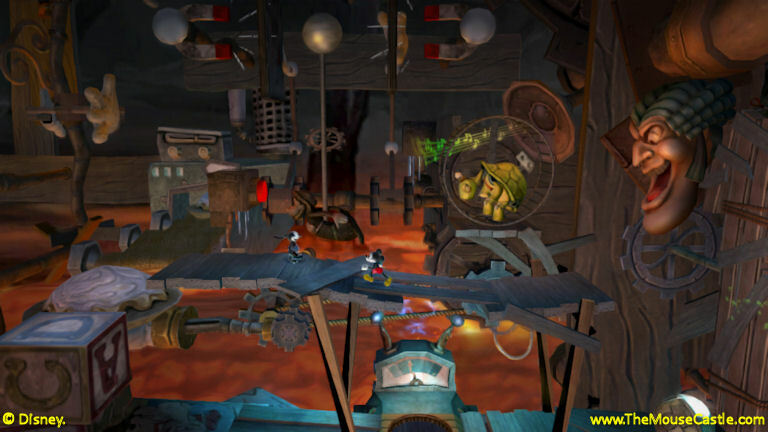 There will be original songs inspired by classic Disney music and plenty of new and different levels to explore in Wasteland. Unlike the original Epic Mickey, Epic Mickey 2 will be available not only on Nintendo Wii, but also on Xbox 360 and PlayStation 3. 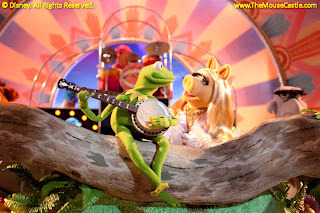 Kermit and Miss Piggy make a Rainbow Connection. 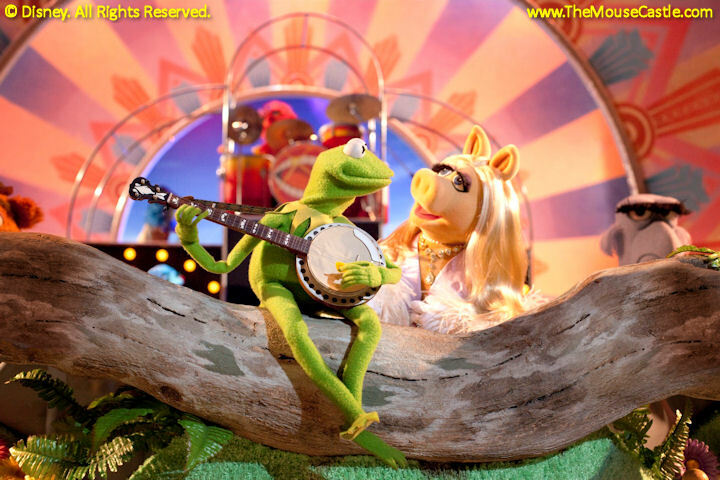 Last night, I watched The Muppets on Blu-ray with the audio commentary on. When it was over, I did something I don't think I've ever done before with a video. I left the commentary on and watched it again. I wanted to make sure I didn't miss anything. There are a number of reasons to pick up The Muppets on home video starting Tuesday this week, the most obvious being the movie itself, which captures all the giddy anarchy that made TV's original Muppet Show a cultural phenomenon. Another reason is that the bonus features on the Blu-ray edition are just about as entertaining, particularly the commentary by director James Bobin, co-writer Nick Stoller and co-writer/star Jason Segel. 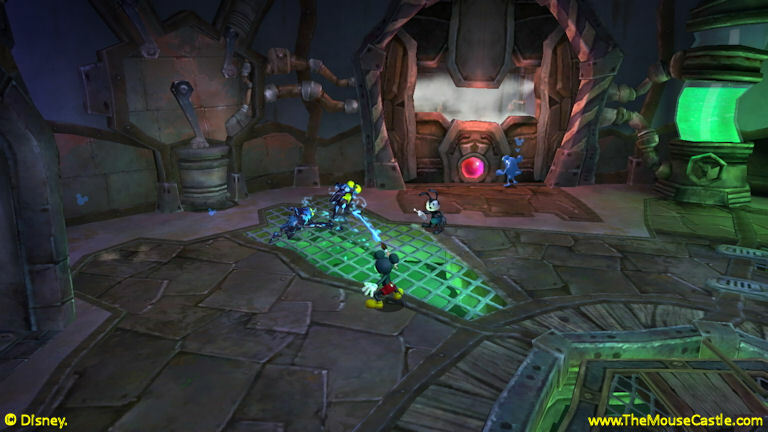 It's not that the trio offers a huge amount of revealing "making of" tidbits. On the contrary, they spend as much time not talking about film as they do talking about it. What's great is they're having such a hilarious time, you immediately understand why everything is so right about The Muppets. It's the same loose, anything goes mentality permeating the film that spills right over into the commentary. 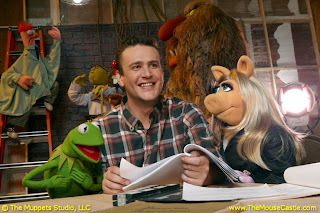 Jason Segel and the Muppets. Segal, Stoller and Bobin riff about their favorite movies, their favorite cars and their favorite clothes. Segel makes sure to name as many of his costar's film credits as possible ("Amy Adams from Cruel Intention 2," "Jack Black from High Fidelity") and throws out every plug he can for the holdings of the Muppets' parent company (Downtown Disney, the Times Square Disney Store, Enchanted on DVD and Blu-ray). We do get some superficial Muppets insight, like how Chris Cooper ("Academy Award winner Chris Cooper," stresses Segal) was cast as wicked oil man Tex Richman and how Jim Parsons (The Big Bang Theory) stumbled into the funniest cameo of the film. If you're looking for any in-depth analysis, however, you're not going to find it here. It's all good, though. What is discussed is a hoot. If you can, make sure to get a Blu-ray version of The Muppets. 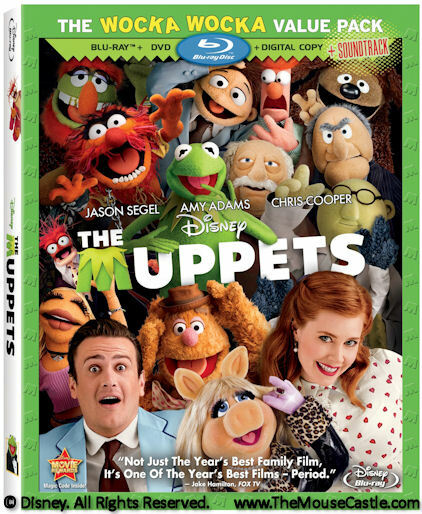 The "Wocka Wocka Value Pack" is the best choice with all the Blu-ray features (the commentary, a "making-of" featurette and deleted scenes), an extra DVD and digital copy of the movie, and a code to download The Muppets soundtrack (with the Academy Award-winning song "Man or Muppet"). The DVD-only version has scant extras: only a surprisingly flat blooper reel. 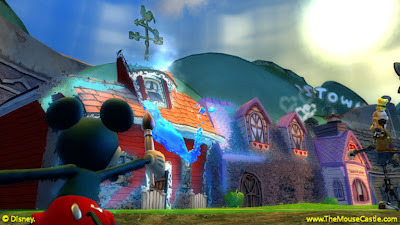 The Mouse Castle is giving away a free copy of The Muppets. Click here to learn how you can win. It was a strange and fitting coincidence that when I first heard about Robert Sherman's death two weeks ago, I was listening to songs he had written with his younger brother Richard. That the songs were on a vinyl record I hadn't played in years--a souvenir from a family trip to Disneyland in 1967--only added to the surreal nature of the moment. The album was The Music of Walt Disney, a collection of classic Disney tunes released shortly after Walt's death in December 1966. Etched into its grooves were "Heigh Ho," "When You Wish Upon a Star," "A Dream is a Wish Your Heart Makes" and 16 other memorable songs. Five of them were Sherman Brothers tunes: "On the Front Porch," "Castaway," "Chim Chim Cheree," "Winnie the Pooh" and "It's a Small World." I wouldn't have even been listening to that record had it not been for a random photo Disney historian Paul Anderson had posted on his Disney History Institute page on Facebook. It's a 1967 pic of a Wonderland Music Shop display window at Disneyland containing an assortment of The Music of Walt Disney albums. Immediately recognizing the familiar face of Walt on the cover, I dug out my copy of the album (surprisingly easy to find) and posted a picture to share on DHI. Circumstances dictated, of course, that I play the record. Say what you will about the convenience of modern digital music, there is still something very special about the tactile action of placing needle to vinyl and listening to rich, analog music. Forty-five years later, the album still sounds wonderful. As the strains of "It's a Small World" were fading out (a charming choral version), Jeff Kurtti, another noted Disney historian--and a former Imagineer--posted a photo of Robert Sherman on Facebook with a simple tribute. "Rest well, my friend, and thank you for the gifts you gave." This was how I first found out the legendary Disney songwriter had passed away. After a period of declining health, Sherman died in London at the age of 86. 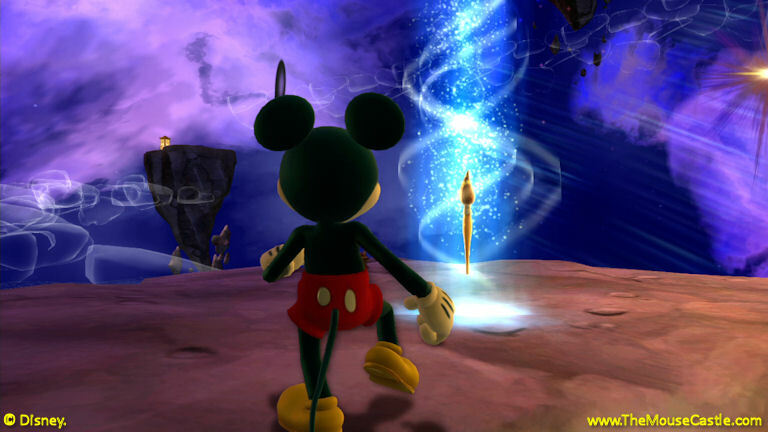 The news was sad not just because of the passing of a talented artist, but because we lost one more person who knew and worked with Walt Disney. There are fewer and fewer people around anymore with that direct connection to Walt. It's disheartening each time another one passes. 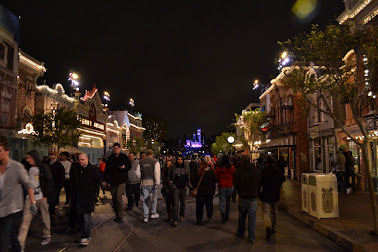 I have never met Jeff Kurtti in person, but he is among a generous group of Disney insiders who connect with fellow Disney enthusiasts through social networking. I'm very pleased to include the likes of archivist Dave Smith, historian Paula Sigman Lowery, animator Floyd Norman and producer Don Hahn in my group of Facebook friends. There are others, but these people stand out to me for their accessibility and support. 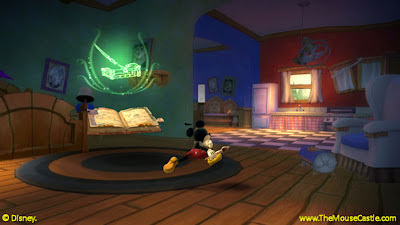 I've chatted with Jeff and Paula online about Disney history. Dave has answered questions for me about Walt. Floyd let me use one of his cartoons in a story I wrote about John Lasseter. Don gave me some encouraging words on a piece I wrote about The Lion King. To an amateur Disney blogger, these things matter. It's very easy to take for granted our present age of electronic interaction, but for those of us who are old enough to remember a world before the Internet, it really is something to marvel at. As a kid in the early 1970s, I sent a letter to the quarterly magazine Disney News. I asked them exactly what it was Jolly Roger said on the Pirates of the Caribbean ride just before you took the first waterfall plunge ("Dead men tell no tales"). It took three months, but the response finally came in a Disneyland envelope that contained a partial copy of the working script for Pirates from the loading at Lafitte's Landing to the complete words uttered by Jolly Roger. I was giddy with excitement receiving an actual response from Disneyland--AND IT ONLY TOOK THREE MONTHS! Last year, I sent a Facebook message to Dave Smith regarding a trip Walt Disney made to Las Vegas (my hometown) in the mid-1950s. About an hour later, Dave responded with the information I needed (Thank you, Dave). Ahh, progress. 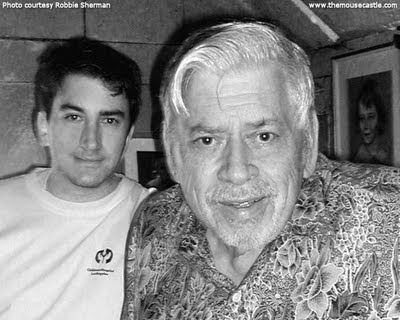 In August, I reached out to Robert Sherman's son, Robbie, about a campaign he was championing to have the Sherman Brothers recognized by the Kennedy Center Honors. By e-mail, Robbie answered a list of questions for me about the campaign, but most importantly offered some very personal insight about his father. Robbie didn't share much about Bob Sherman the songwriter, but plenty about Bob Sherman the painter, model plane-builder and problem-solver. 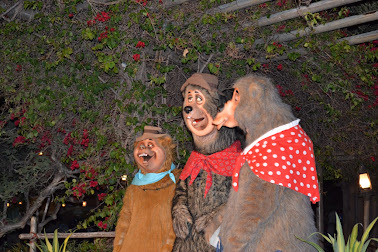 It was a pleasant reminder that to we Disney fans who perceive our heroes in terms of their professional output, there's a personal side we seldom consider because we rarely get to see it up close. Robert Sherman may have delighted the world with "Supercalifragilisticexpialidocious," but to his children, he was Dad. Robbie Sherman and his father in 2003. He wanted to bring happiness to the world and, unquestionably, he succeeded. His love and his prayers, his philosophy and his poetry will live on forever. Forever his songs and his genius will bring hope, joy and love to this small, small world. All of these stories and videos were shared in real time, spontaneous and sincere. We've come to expect this as the norm of today's technology, bringing people together at times of joy and times of tragedy to share their thoughts and fears, their hopes and dreams. And yes, we often do take it for granted. But, it's important to pause every now and then to appreciate how remarkable the online community is. 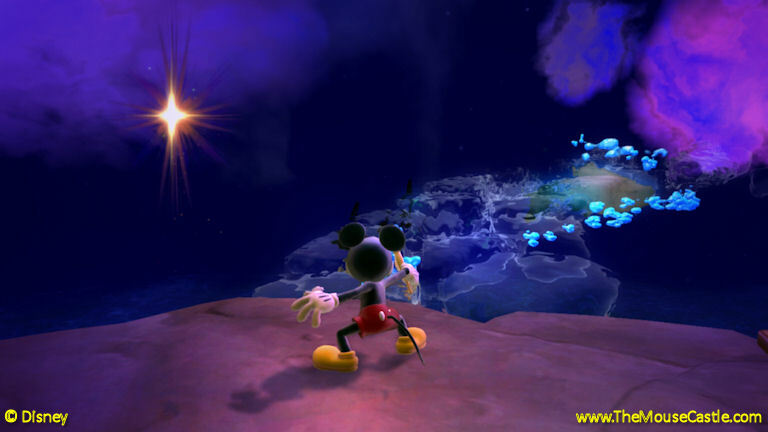 I'm grateful for the continually growing circle of Disney artists and professionals, fans and friends I've come to know--in-person and virtually--over the years. The Shermans were right. It truly is a small world, after all. I never met you, Bob, but through this amazing group of people who've loved and admired you, I've gotten to know you just a little bit better. I will miss you. Rest in peace. Singing chickens. Explosions. Fart shoes. You could win them all! On March 20, Disney releases The Muppets, starring Jason Segel, Amy Adams, Kermit the Frog and Miss Piggy, to home video. 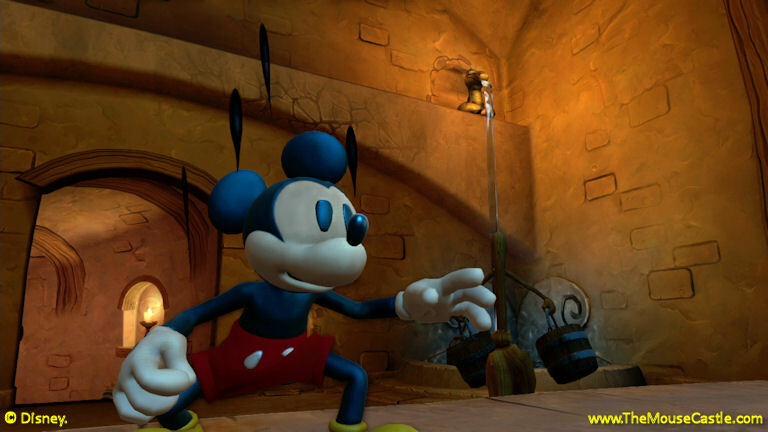 You can win your very own "Wocka Wocka Value Pack" containing both a Blu-ray and DVD copy of the film--plus a code to download the movie soundtrack--just for being a loyal reader of The Mouse Castle. 1. Become a fan of The Mouse Castle (if you aren't already) by "Liking" our Facebook page at www.facebook.com/themousecastle. 2. Click that you are joining/attending "THE MUPPETS: Wocka Wocka Value Pack Blu-ray Giveaway" event at www.facebook.com/events/366659563355935. 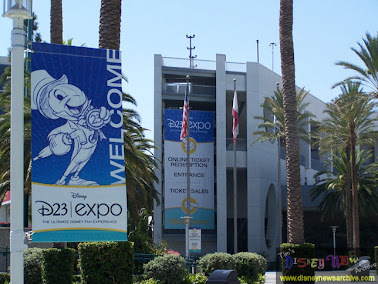 Get your entry in no later than March 27, 2012 at 6:00 p.m. Pacific time. You must be a resident of the United States to enter. Only one entry per person, please. Remember, you must "Like" The Mouse Castle on Facebook and click that you are joining/attending/confirming the giveaway event. Sometime after the entry deadline, we will draw one winner at random. 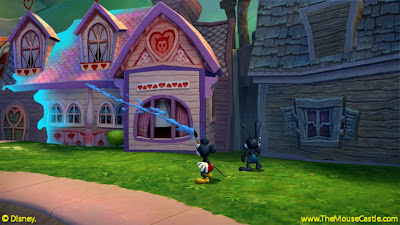 The winner's name will be posted on The Mouse Castle Facebook page. Walt Disney Studios has released the first image from the on-again, off-again (but now back on again) Western adventure The Lone Ranger. In the pic, Native American spirit warrior Tonto (Johnny Depp) casts a sidelong glance at Texas Ranger John Reid (Armie Hammer). The Lone Ranger is being produced by Jerry Bruckheimer, directed by Gore Verbinski and written by Ted Elliott and Terry Rossio, the same team behind the original Pirates of the Caribbean trilogy. It promises to be a revisionist take on the classic Lone Ranger story as the unlikely duo joins forces to fight greed and corruption. Given the parties involved, expect an exciting and humorous action-adventure with plenty of explosions and a story that's difficult to follow. 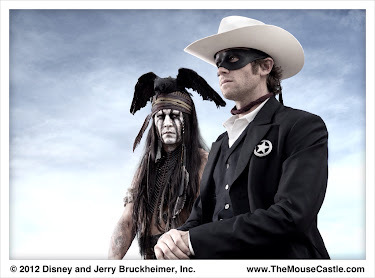 The Lone Ranger will be Disney's summer tentpole next year, with a U.S. release date of May 31, 2013. Yesterday, after months of speculation, Disney finally made it official. 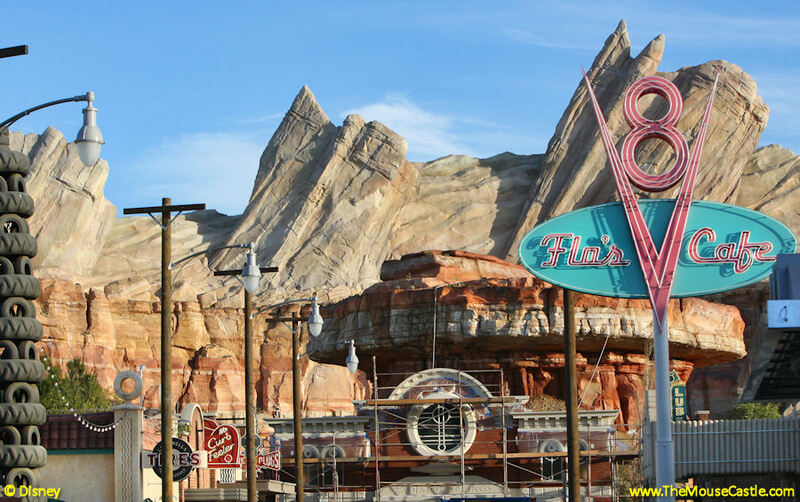 Cars Land and Buena Vista Street will open at Disney California Adventure on June 15. They'll be the final additions of a 5-year expansion and re-theming of the once-maligned park. Disney has spent over a billion dollars to make DCA stand out on its own with new shows and attractions including World of Color, Ariel's Undersea Adventure, Silly Symphony Swings, Goofy's Sky School and a general face lift for the Paradise Pier area. It's a series of improvements that even John Lasseter (wearing his Principal Creative Advisor for Walt Disney Imagineering hat) acknowledges was much needed. 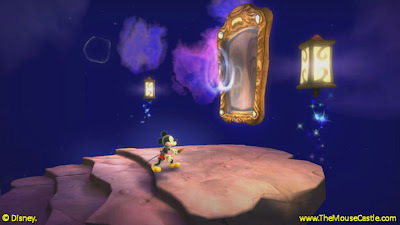 In an interview last year, he said "There's a magic to Disneyland, the original park. And, when California Adventure opened up (in 2001), it was not a Disney Park. 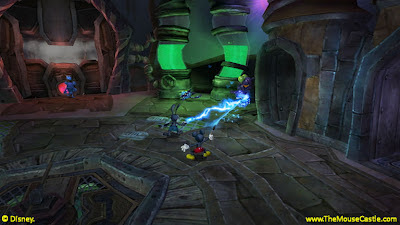 It was a Disney park on a budget." The faux-Southwest vistas of Cars Land take up 12 acres on the south end of DCA. 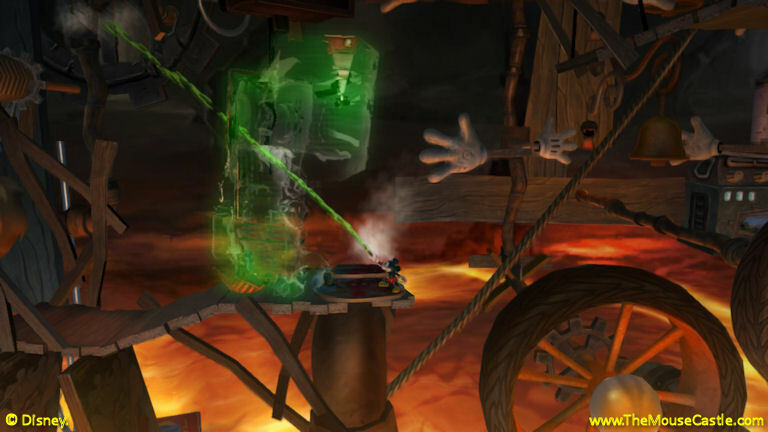 Its E-ticket attraction, Radiator Springs Racers, a Test Track-like high-speed spin through Ornament Valley, will be one of the largest single rides Disney has ever built. Other attractions up the street include the kid-friendly tractor ride, Mater's Junkyard Jamboree, and the ride I'm looking forward to the most, Luigi's Flying Tires. It's patterned after Disneyland's iconic Flying Saucers of the early 1960s, the one attraction that as a child I was too small to go on. By the time I would've been big enough, the ride was torn down to make way for Tomorrowland 1967. To a four-year old who thought the Saucers were the coolest thing ever, it was devastating. I've waited over 45 years to finally get my turn. I can't wait. When the temporary walls that have been lining the entrance to DCA come down in June, they'll reveal a brand new Buena Vista Street, an entrance plaza that will capture the spirit and style of Los Angeles in the 1920s, the time when Walt Disney first came to Southern California to seek his fortune. The centerpiece of Buena Vista Street will be the Carthay Circle Theatre, patterned after the famed site where Snow White and the Seven Dwarfs premiered in 1937. 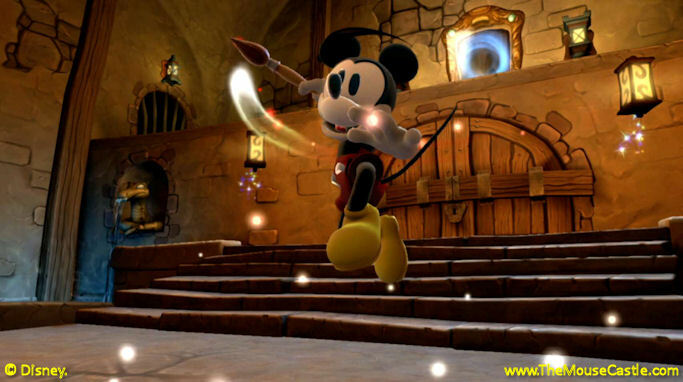 The building will house the Carthay Circle Restaurant, a fancy restaurant and lounge. Traversing Buena Vista Street will be two Red Car Trolleys, modeled after the transportation system that once serviced Southern California. 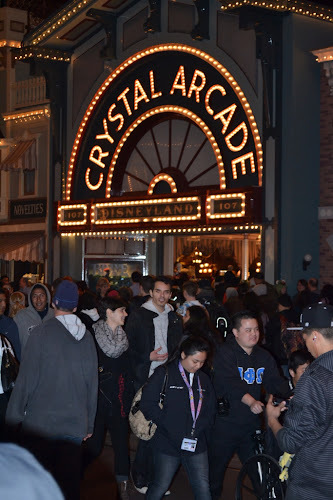 Other additions that will round out DCA Redux are the Ghirardelli Soda Fountain and Chocolate Shop at Pacific Wharf and the Mad T Party, which will replace ElecTRONica as the Hollywood Pictures Backlot's hopping night spot. To make final preparations for the grand opening and to allow for a media preview, DCA will be closed on June 14. 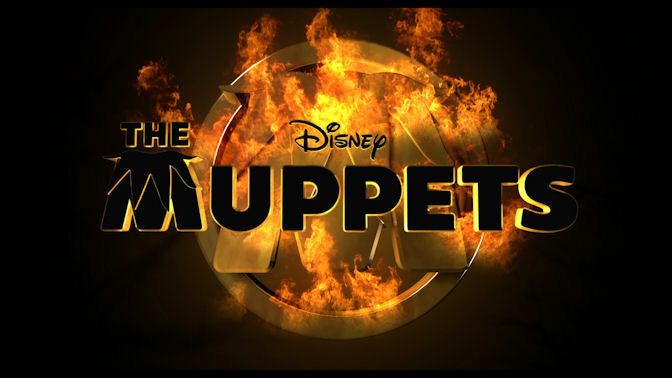 The Muppets will be out on home video in two weeks. Some other movie will be out that week too. Margaret Kerry has had a busy career in entertainment. She began acting at the age of 4, appearing in the 1935 film A Midsummer Night's Dream and a number of Our Gang comedies. Later, she co-starred in one of the first sitcoms on television, The Charlie Ruggles Show. She's done voice work in hundreds of cartoons, hosted her own radio talk show and even shared the screen with the Three Stooges. 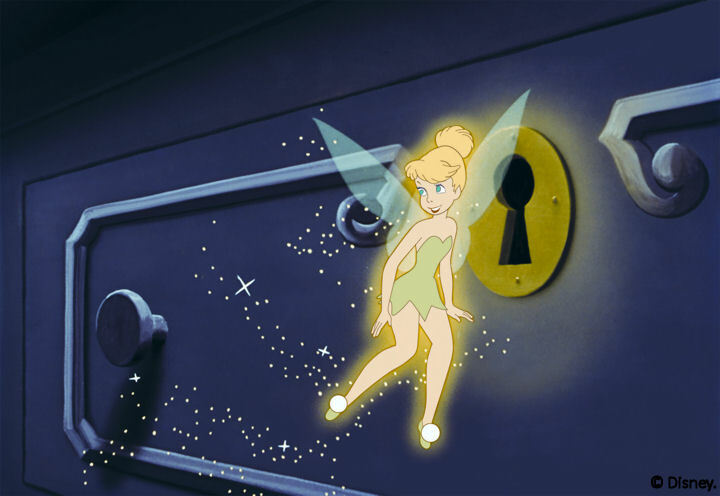 To Disney fans, though, she'll always be Tink. Working on a Walt Disney Studios sound stage in 1950 and 1951, Margaret was the live-action reference model for Tinker Bell in Disney's Peter Pan. The urban legend persists that Marilyn Monroe was somehow the inspiration for the tiny pixie, but the truth is it was all Margaret. 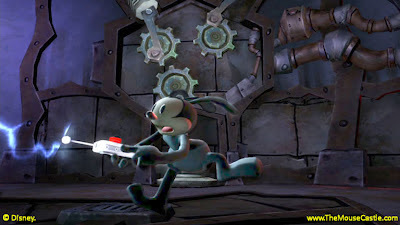 She handled huge props and peeked through keyholes on the empty stage, using her dance and pantomime skills to assist animator Marc Davis in the development of the character. Tink's famous pout? Margaret. Upon seeing Peter Pan for the first time, Margaret's late husband, Jack Willcox, noted, "I'd recognize those thighs anywhere." At MiceChat's 7th anniversary celebration in January, I sat down with Margaret and talked with her about her long career, her loving fans and how she keeps the Disney magic alive. If there's such as thing as a Disneyland hangover, I have one. Since Thursday. The dull ache in the back of my head finally subsided, but my body is sore and I'm still tired. Thursday afternoon, I was grateful to be staying at a hotel. I couldn't remove myself for any meaningful period of time from my bed. Room service was my friend. I couldn't imagine anyone returning to anything resembling a normal life on Thursday. If you were a survivor of February 29th's "One More Disney Day," you have my sympathies. I made it through 22 of the 24 hours inside the park. Then, at 4:00 a.m., I hit the wall. No more. Exhaustion and impatience won. It wasn't just that I was tired. 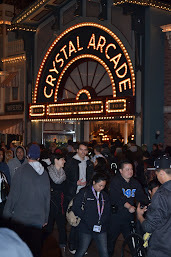 It was that Disneyland remained insanely crowded. All. Night. I couldn't fight it anymore. After a day that was moderately, but manageably, crowded, all hell broke loose when the sun went down. The crowds began swelling in the late afternoon when people left work and school to pull the all-nighter. 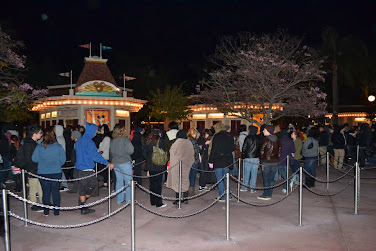 When Disney California Adventure closed at 8:00, all of those guests crossed the esplanade and joined ranks at the Busiest Place on Earth. By 10:00 p.m., Disneyland had reached capacity and the entrance gates were closed. That lasted about an hour. When the gates reopened, a cheer went up from the masses waiting to get in. The flood of humanity continued. There was a two-hour wait for Space Mountain, an hour and a half for Star Tours--and that was at 3:00 a.m. Inexplicably, Disneyland had closed Fastpass distribution. After 8:00 p.m. all lines were standby. Those of us who had been toughing it out at the park since 6:00 a.m. waited for the crowds to subside. "It'll thin out after midnight." "A lot of people will leave after the 1:00 Fantasmic! show." "OK, Billy Hill and the Hillbillies at 1:45 and they're done." I took these shots while waiting for friends to get coffee at the Market House. That was only about a 45-minute wait. The line for the corndog cart near the first aid station off of Main Street stretched nearly to the Astro Orbitor in Tomorrowland. All the extra bodies meant a ton of extra smartphones, which meant phone and data lines were slammed. My ambitious plan to continue blogging from the park all night was dashed with my 10:45 p.m. post. It was taking too long to post messages--and forget about uploading pictures. If I may quote C3PO, "This is madness!" Especially since I'd been up since 4:00 a.m. the previous day. I was losing patience. 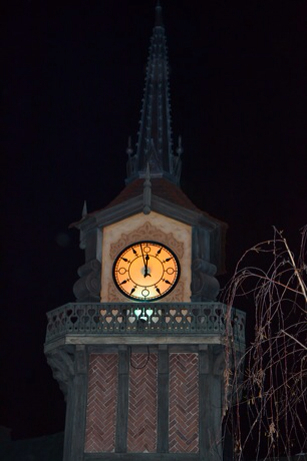 They also fired up the music on Main Street at the top of each early morning hour. Harry Belafonte's "Jump in the Line" was just the ticket at 2 a.m.--even if we were no longer physically capable of jumping. And still, the people kept coming in. Scour the message boards on any number of Disney fan websites and you'll see a lot a criticism heaped at Disneyland for how the night went. Too many people, too many teens smoking pot, too many people asleep in the Main Street Cinema. Given the crowds, if those are the worst complaints, it wasn't a bad night. Certainly not Disneyland and certainly not any guest I spoke to expected the park to be as busy as it was. 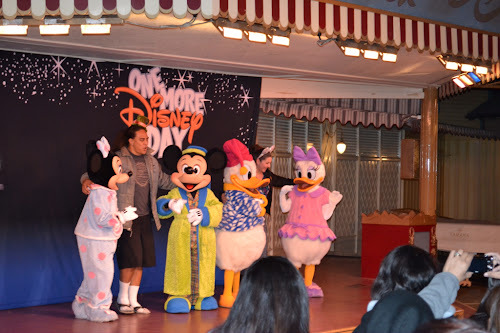 Disney cast members were clearly overwhelmed by the numbers, but from my perspective they made the best of it. My only gripe was the early closure of Fastpasses. Otherwise, everyone made it out alive...and hopefully got some sleep...and didn't take three days to recover like I did.